It's a cold winter here in Montréal, Canada. We did hit less than -40°C. I can't open my Yaris HB 2008's back door. At first I could not press the cylinder (once unlocked) to release the latch so I had the brilliant idea to hit it with a piece of 2x4 I had in the car, thinking it was only frozen. It got in instantly, but could not come back. Now somehow I am able to turn the key in the cylinder both clockwise and counterclockwise, to move the cylinder back and forth (although it stays in the last position now, there's no spring-loaded action going on), but whatever I do, the door won't open. First question: is there a way to open the goddamn back door from the interior? It seems like I have access to the assembly from a little rectangle opening on the interior side of the door. How could I release the latch? I don't want to put too much money into this, so I don't care if I need a different key, or even no key at all (I can unlock with the actuator from the central Unlock button or even with a double-clockwise turn in the driver's door's lock I guess). My guess is that the actuator and latch assemblies are still okay, only the cylinder is f*cked. I'm asking here before investigating myself because it's freaking cold in here and I will need to rent an interior DIY garage lot to be able to work on this without entering hypothermia. I repaired both hatch latches on my two Yaris'. Both required removal. In fact, yesterday, I repaired the assembly on the 08. You can open the tailgate by accessing the little plastic rectangle insert you mentioned. Use a screw driver to push the small steel tab sideways. If you fold down your back seat and lie with your head on the floor, you can shine a light in there (I use my cell phone). Once you get the hatch open, you can pry (carefully!) the plastic hatch panel off. A number of the clips will remain in the steel hatch. These can be removed by prying (again carefully) with a screwdriver. One 10 mm bolt holds the assembly in place. Once removed, there is a "C" retaining clip that can be removed and the lock cylinder will come out. Clean that thing like crazy inside and out. I used electronics cleaner. Then lubricate it well. I had to work mine gently back and forth in a vice to free it up. I put the short steel shaft in the vice and with channelock pliers, carefully worked the cylinder back and forth until it was freed up. New latches are expensive and then have to be rekeyed. Both of my latches were repairable and yours probably is too. 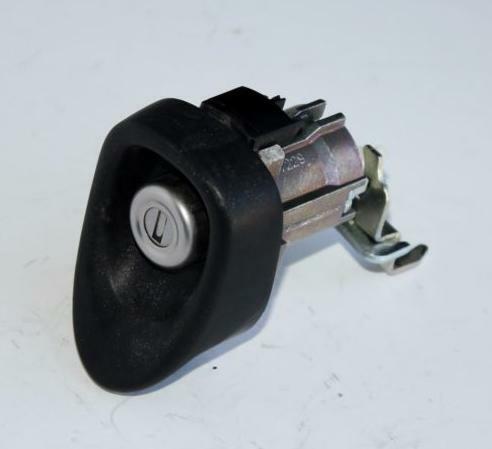 The little lever attached to the key cylinder that releases the latch mechanism on the car can skip out of position to the wrong side of the latch arm. This had also happened on my 08. I just repositioned it properly when reinstalling. You're giving me some hope here. As I wrote, if it's definitely broken, I don't care if I can buy a cylinder without its key... I'll just use the electric actuator to lock and unlock the back door. I'll look into it, but how does this work exactly? I'm thinking this part with the cylinder (see photo) is linked to the latch with a cable? Or is it directly coupled and there are cables to the actuator? I will follow your directions anyway. Do you know if the parts are the same for the 2-door and 4-door HB? Happy to help. The button to latch mechanism itself has no cables. To be honest, I rarely lock the hatch and not even sure if my power lock button will control the hatch lock. It does have an actuator that is connected with a nylon mechanism. I will go test shortly to see if the door actuator will lock and unlock the hatch. I expect that it's the same mechanism in both 2 and 4 door. Here is a pic from when I fixed my 06 latch with some additions to help you understand how the mechanism works. It's really quite an ingenious bit of engineering, but it's really prone to contamination and seizing, hence the need to regularly blast it out with a cleaner and then lubricate. I wish now that I'd taken pictures yesterday to help illustrate for you the workings of the whole mechanism. Thank you for the information again, it helped a lot. I'm documenting the process here with more photos. The little lever attached to the key cylinder that releases the latch mechanism on the car can skip out of position to the wrong side of the latch arm. This is indeed what happened, I guess when I hit the whole cylinder when it was frozen with a 2x4 stud. When you remove the little rectangle cover on the back door's trim, it is quite straightforward and easy to open the back door. I guess this is the exact purpose of this little opening. The red part (on the lock assembly) should be above the yellow part (latch assembly) to press on it. When you press on the cylinder, the red part pressed on the yellow part. 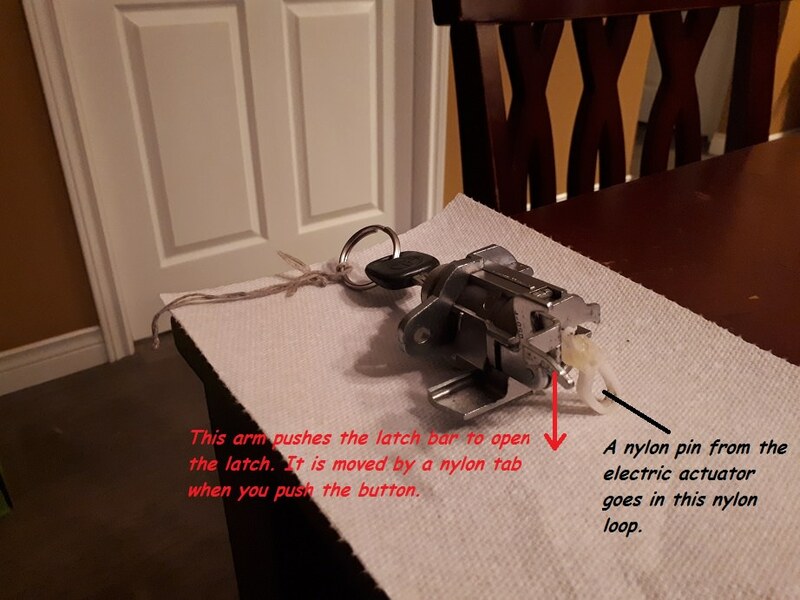 What decides if, when you press, the latch unlocks or not is the white part on the lock assembly and this is set by either the key or the actuator. There's a video below which shows how this works exactly. That lock assembly was very dirty. I used brake cleaner and then a dry lubricant (which is rated for -65°C and one of the use cases is to lubricate a lock), always turning the key in the cylinder a lot to clean it as much as possible. Here's a video showing how the lock assembly works. The white part I turn with my fingers, again, is controlled by the key or by the actuator so that both methods can lock and unlock the back door. It is indeed a nice piece of engineering. In my case, this cylinder was frozen and dirty, so it would not come back, even though there's a huge spring to push it back. Everything works fine and is smooth now! This will no doubt save many people money and aggravation as well as give them the satisfaction of completing a valuable repair themselves. I couldn't see the whole label of the dry lubricant you used. Would you mind providing the details on that? Thanks! It's not dry at all, I missed the point. But it still works. I don't have the can with me now, but it looks like this: PL-100 SUPER MULTI-PURPOSE PENETRATING LUBRICANT. Picked this at Canadian Tire for my fellow Canadian Yaris owners. Thanks. I'm not really sure what's the best for these locks. I've heard everything from motor oil to graphite powder spray, but I'm just using Rust Check (the red can) for now. I try to give it a good long blast of ReleaseAll or electronics cleaner inside the key hole occasionally, then shoot some rust check in there. the 2010 Yaris Sedan- the trunk lock cylinder is different then this. having issues w/ mine now and just pulled it. Its frozen.